The Search for Peter McKie. Finding the birthplace of our grandfather Peter McKie, was the main reason for our starting our family history research. After several years we still have no written evidence of where that was, although there are strong indications for one particular place. Dad did not know where his father had been born, as he had died when he was only six years old. As far as he knew, his parents had been married in Malta whilst Peter was serving in the British Army. His mother was Maltese and even when Dad was young, her English was still not too good. Over the years, we had gleaned various stories of Dad's childhood, and his parentage as far as he knew it. Peter McKie was a Scot married to a Maltese, and was self-employed as a chairmaker, the main item being a fold up canvas seated stool, like a camping or fisherman's stool, which he and his eldest sons would often take to race-courses to sell. Grandfather had at least one brother who had migrated to America. This brother had obviously done quite well for himself as on at least three occasions he had sent sufficient money to pay the fare of Peter and his family to go to America. Peter being a drinking man, the money was spent elsewhere. Dad said he was the seventh son, and I was always under the impression that he was also the last, however that was not the case. Following the death of Peter McKie in 1906, the elder sons continued the chair-making business for some years at various addresses in Stepney or St. George in the East, as much of it was known. . Some time later, Grannie took in a merchant seaman as a lodger, and later married him. So that was the basis on which we commenced our search. We started with the records of Army marriages, but there was no sign there, we then thought that perhaps they had gone through a Church marriage without informing the army authorities, so we wrote off to Malta but again no record in the civil registration system there…. So perhaps they had not got married at all. We then turned to the possibility of finding a record of Peter's army service. At that stage we were not aware of how difficult that could be. With the name McKie, we thought it reasonable that he would have been in one of the Scottish regiments. So from the National Museum of Scotland we obtained the names of all those regiments which had served in Malta for the twenty-year period 1870-1890 and paid a researcher to go through the records at the Public Record Office at Kew. However, no result again- no Peter McKie serving in those regiments during that time. We subsequently rechecked those records for ourselves a few years later. Dad's birth certificate, which we obtained, was not a great deal of help. Although we knew the names of several of the siblings, we did not know their relative ages. So despite the fact that there are not a great number of McKie births listed on the GRO indexes for the twenty years before 1900, we could not positively identify other brothers and a sister. Serendipity often plays a part in family history research , and it then came into play for us. Whilst researching Jean's family in the Bermondsey area, we hired the film of the 1881 census for that area. Whilst looking through the film I was astonished to find an entry in Snowsfields, Bermondsey for Peter and Gessippa McKie and three children. A return to the GRO indexes then turned up the birth records of those three, as well as the death of one of them. There was also a marriage in 1878. 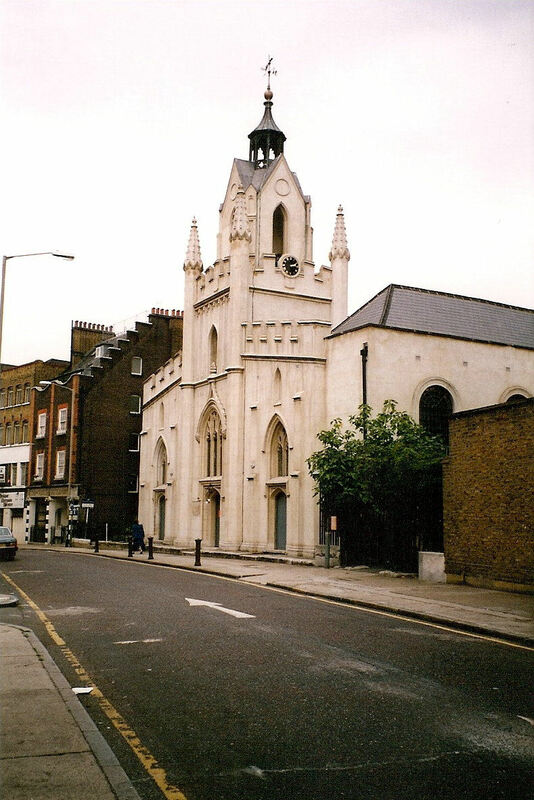 This had taken place at the church of St. Mary Magdalene in Bermondsey Street, Bermondsey. The census confirmed that Peter had been born in Scotland and Gessippa in Malta. There was also another clue on the 1881 census, but we were not to recognise that at the time or indeed for some time thereafter. Living in the same house was a Mary Anson, whose birthplace was shown as Malta, and we guessed that there was some connection between the two families, particularly as both had sons with the unusual Christian names of Richard West. However, due to the fact that Mary's former name of Mamo was shown as Mawes on the marriage certificate that we obtained , it was some time before we could prove a relationship. We then turned to the 1891 census for the same area and found Peter and Gessippa just round the corner in Melior Place. Birthplaces still Scotland and Malta, but the ages were not ten years different from those in 1881. We then sent off for the 1901 census and again different ages. His death certificate in 1906 showed age 53 so born 1853. Whereas earlier the same year when he enlisted in the army, he claimed to be 19, so born 1852. Peter McKie enlisted in the 101st Regiment of Foot of the British Army in Dumfries, Scotland on the 15th February 1871 and was said to have been aged 19 at the time. The 101st was a Regiment of the Army otherwise known as “The Royal Bengal Fusiliers”. Although recruited in Dumfries Peter was immediately dispatched to the Depot in Aldershot, Hampshire where he appears on the 1871 census, taken on 2nd April, as a private aged 21. He obviously managed to survive his initial training without too much trouble whilst at Aldershot and later in Bury Lancashire. However in November of 1871 began a series of problems with the army system. His Army record has not survived so we are reliant on the Regimental Pay books for the brief details of his service that we have been able to ascertain. Whilst the Regiment was stationed in Bury, Lancashire, Peter was in the cells and guard room from 17th to 23rd November and again from 11th to 17th December 1871. No details of his offences were recorded, they need not have been serious for such sentences, however it would certainly have had him labelled as either difficult or a trouble maker. From the end of 1871 to the 1st April 1873 he appeared to be trouble free from a military point of view, whilst serving in Bury and later in Manchester. However on 14th April 1873 Peter was brought before the Salford Quarter Sessions, charged with Larceny and receiving a cash box containing £40/6/7d the monies of William Burns. Burns was a Sergeant Major in the same Regiment. Peter was sentenced to six months imprisonment. Presumably this was served in one of the Manchester Prisons, although the records of such have not survived. The sentence of six months imprisonment appears to be somewhat lenient for the time and for the sum of money involved, so there may well have been some mitigating circumstances of which we are not aware. On his release from prison, Peter returned to his Regiment which was stationed at Fleetwood and later at Parkhurst on the Isle Wight. The Regiment remained at Parkhurst until 6th October 1874, when they sailed on the Troopship Malabar en route for Malta, where they arrived on 22nd October. 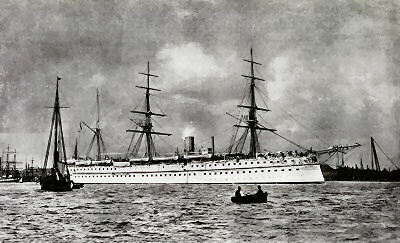 The Malabar was sail assisted steam ship operated for the British army which made regular voyages to India, to rotate the large number of troops stationed on the sub continent at the time. The route regularly included stops at Malta, to disembark units to be stationed there. The journey usually took about two weeks, and may well have been something of an adventure for a country boy, weather permitting, of course. October would not have been a good month for sea journeys which involved the Bay of Biscay. Peter and the 101st remained in Malta until 1878. We have no definite information as to his location in Malta, but there is a good chance that he was stationed at least for a period of time at Floriana, where there was an Army encampment in this virtual suburb of Valletta. There was also the Verdala Barracks in Cospicua, one of the five towns of Valletta and the birthplace of his future wife. For the first year or so that the battalion remained in Malta, Peter apparently could not keep out of trouble. He served 8 days in the guardroom from 22nd to 30th August 1875 and then over three months in a military prison from 31st August to 8th December 1875. He was again in a military prison from 1st January to 9th February 1876. These military prison terms imply more than just simple misdemeanors, or insubordination. From then on he had no further trouble and even managed to earn some good conduct pay. It would no doubt have been during his later time in Malta that he met his future wife Gessippa. She was a teen aged orphan who, together with her elder sister Rosina , appears to have remained in Malta when her widowed mother had remarried and gone off with her new husband who was serving in the British Army and had been sent to India. Peter left Malta 9th October 1877 shortly after the 101st had transshipped to Cyprus on its way to Nova Scotia. We have no details of his actual discharge date. Presumably Gessippa went with him, as she was already pregnant. They may have married in Malta in Valletta or nearby, but we have not been able to trace such a marriage. The subsequent marriage in Bermondsey may well have been to ensure the validity of the marriage, as there was some doubt at that time of the legal recognition of the marriage of British soldiers in Catholic churches in Malta. The Parish Register for St. Mary Magdalene, Bermondsey shows that Peter McKie, a bachelor, of full age, a labourer and the son of James McKie, married Jesseppa Mamo, aged 18, a spinster, in the church on December 16th 1878 Gessippa’s father was incorrectly shown as James. Their first child Mary Jane was born on February 25th 1879 when the family was living at 227 Bermondsey Street, and the father's occupation is shown as Army Pensioner. Their first son Frank was born 1st March 1881 at 21 Snowsfields, Bermondsey and died the following year. The second son, Peter was born on 8th June 1883, and by this time the family had moved to 6 Ferguson Rents, Snowsfields. The father's occupation then was as a Wharf labourer. 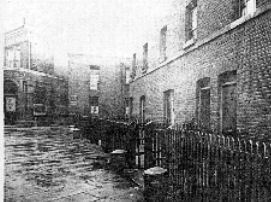 By the time of the birth of Thomas on 8th September 1885, they had moved again, this time to 3 Webb's Court Snowsfields and Peter was then a General labourer. Both Joseph on 5th February 1891 and Richard West on 9th April 1893 were born at 4 Melior Place, the longest they had stayed in one place up until then. At both these registrations, Peter's occupation was shown as Wharf labourer. There was another son, Andrew who was born about 1897, but we have been unable to trace the birth registration. Ernest was born on 9th August 1900 at 121a Pennington Street, Stepney and Peter by then had adopted the trade of Chairmaker. part is recording information supplied by informants so that there is considerable scope for errors to occur. The marriage certificate for Peter and Gessippa show her father as James Mamo, whereas he was Joseph Mamo. Also she was shown as 18 years of age when she was actually a little over 16. When Gessippa married George Pokham, her father is shown as Thomas Hennesy. This last anomaly we have no explanation for. When Gessippa registered the birth of her children- her former name is given variously as Mems, Mamma and Mamule. Bermondsey in 1878 was an industrial area for the most part consisting of factories and workshops surrounded by slum and near slum dwellings for the workers in the various industries. Brewing, leather dressing and the production of vinegar, brought about a heady mixture, which permeated every street. Nearby was also Peak Freans biscuit factory and Spillers dog food factory. Horses were still the main motive power for the thousands of carts used to carry the products of the factories to the distribution points. Adding to the numbers were the numerous carts of all sizes, that were used for the cartage of goods offloaded from the lighters and ships at the adjacent wharves. We have used the spelling of Gessippa that appears on several of the birth registrations, but this is an Anglicization of the spelling of Giuseppa, which was more common in Malta. She had been born in Cospicua in 1862, the daughter of Joseph Mammo and Liberatta (formerly Xerri). Her father had died just before she was born and her mother had remained a widow for six years. In 1868 Liberatta married a British soldier, Thomas Anson, and when his regiment moved to India in about 1870, his wife and children went with him. The two children of her first marriage however remained in Malta, one hopes with grandparents, although we do not know this. Thomas Anson obtained his discharge from the Army in India in 1873, and they all returned to England and shortly thereafter went to live in the Southwark area. Jessie, as she was known was only 16 years of age when she married Peter, who was at least ten years her senior. She was quite short under 5 feet tall, of typical Mediterranean complexion. The contrast between Bermondsey and Malta, where she had spent her early life would have appeared to be very great as she left St. Mary Magdalene's Church on a gloomy December morning. The parish register shows no addresses for the couple, the place of abode merely being stated as "Bermondsey". However as Banns had been read in the normal fashion for the three previous Sundays, then it is reasonable to suppose that they were actually residing in the parish. When their first child, Mary Jane was born on Tuesday 25th February 1879 they were living at 227 Bermondsey Street, which was a butchers shop run by Thomas Tate who also lived there with his wife Emma and son Charles, presumably they rented a room over the shop. By early 1881, they had moved to 21 Snowsfields, only a short distance away, Where Jessies mother, stepfather and their children were living. It was here, on Tuesday 1st March in that year, that their ill fated first child, Frank, was born. Frank was not to survive into adulthood and died the following year. A further move was made shortly thereafter, and by the birth of the third child, Peter, on Friday 8th June 1883 the family was living at 6 Ferguson Rents, Snowsfields. In 1885, at the time of the birth of son Thomas, on Friday 18th September, a further address appeared on the Registrars records. This time it was 3 Webb's Court, Snowsfields. By the beginning of 1891, they were living at 4 Melior Place, although of course in the intervening period, there may well have been other dwellings. Melior Place had as a neighbour “Vinegar Yard” where this by- product of the local brewing industry was stored. Fish and chips had yet to become as popular a dish as they were to be later.. Son Joseph was born at Melior Place on Thursday 5th February 1891 and this was also the birthplace of Richard West on Sunday 9th April 1893. Sanitation was poor which was a considerable factor in the high infant mortality rates. Quite large families were often crowded into one or two rooms. At 21 Snowsfields, this two storey, four-roomed house was shared with two other families, one of which were Mary Anson and her children. It was to be some time before we realised that Mary Anson was in fact Gessippa's mother, but more of that later. The McKie family was better accommodated when they moved to 4 Melior Place, which was only round the corner. There they occupied the whole of a three-roomed two-storey house. When the move to the other side of the river to Stepney took place is not clear, nor the reasons for the move. The family had been established in Bermondsey for over fifteen years, and although working class families frequently moved from one set of rented rooms to another- it was not often that they moved completely away from a district. A move to the other side of the river was even more unusual. A possible reason may well have been the building of the Tower Bridge, which had been completed in 1893. The provision of new approach roads to the bridge had resulted in the demolition of a large number of houses in the area, and this had no doubt created pressure on the remaining accommodation and an inevitable rise in rents. In August 1900 the family were living at 121a Pennington Street, Stepney and Ernest was born there on Thursday 9th August. Pennington Street runs along outside the walls of the London Docks, which had been constructed in 1802 surrounded by twenty-foot high walls. These high walls had been constructed to cut down on the theft and pilfering from the ships and docks. The only way in and out was through the massive gates, constantly guarded by the dock police. The high walls also ensured that the neighbouring houses were in constant shade. The area was no improvement on Bermondsey, comprising narrow streets, courtyards and alleyways, where everyone lived cheek by jowl with their neighbours. The East End of London had been notorious for a century or more, and the early twentieth century brought little change. Some slum dwellings had been cleared to be replaced by the tenement blocks built by well meaning charities. Whilst a great improvement on what had gone before, by present day standards they still left a great deal to be desired, with the water supply and toilet facilities still being shared by several families. Pennington Street however, was still a long row of two and three- storeyed houses, which had been erected more than a hundred years previously. A contemporary writer, referring to the houses that were erected, said, "Those and others are almost without exception mere hovels, when compared to the habitations within the city of London,” Imagine then what they were like a hundred years later. There were two dock gates on Pennington Street, so there was considerable traffic, still not greatly motorized as yet– so a constant stream of horse drawn carts– laden with goods on their way to or from the docks. The sheer volume of traffic made life difficult in this neighbourhood , apart from the noise, and the smell, the damage to the cobble stones was quite considerable, making them hazardous for man and beast alike. 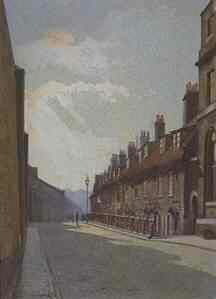 Just a stones throw away was St. George's Street, which had previously been the notorious Ratcliffe Highway. In times past the Highway as it was known, was the scene of mayhem and murder, and still not safe for respectable folk to walk alone. Whitechapel, the scene of the Jack the Ripper Murders, twenty years previously was also within walking distance. 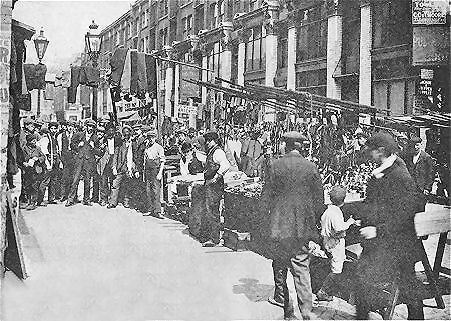 The well known Sunday market at “Petticoat Lane” was also only a walk away and together with the “Jews Market” near Brick Lane was regularly visited. The weekday street market in Watney Street was somewhat nearer, and was the venue for everyday shopping. Street markets in those days were the normal places that working families went for their needs, rather than shops as we know them today. It has to be remembered that supermarkets did not exist at that time, and although the firms that were later to be come large national chains were already in business, they still comprised in the main, small grocery shops in the more affluent areas. In the east end, whilst small corner shops selling grocery lines, existed, shopping by and large was done at the street market. Stalls for the most part stuck to their own commodities, the butcher, dairy man, fruit and vegetables, and so on. Even though the butcher and the baker had his shop, more often than not there was also a stall outside in the street as well. Peter's occupation at the time of the marriage was shown as a labourer: but at the registration of Mary Jane's birth, Gessippa advised the registrar that he was an army pensioner. He was later to work in the docks both in Bermondsey and possibly later in Stepney, before setting himself up in business as a chairmaker. Working in the docks was a precarious livelihood at the best of time. There were very few permanent employees of the stevedoring companies- most were casual labourers hired by the day. This involved attending at the dock gates every morning, hoping to be chosen for what ever work was going to be available on that day. The foremen or gangers were those who chose the men to be employed and as is inevitable there were a great deal of nepotism and favouritism involved, which caused considerable bitterness amongst the men. The work was hard and physical. Most of the ships were unloaded by hand- with the dockers going down into the holds and carrying out the cargo. Some simple hoists were in use, but very few cranes. Backbreaking work for long hours and low pay. The change over to being a self employed chairmaker occurred before the turn of the century. It may well have been that Peter injured himself, like so many dock workers did, or there may have been some other reason. The chairs he made were mainly of a fold up variety with a canvas seat, similar to those used by campers and anglers today. However the design is an old Scottish one and there are illustrations of this type of seating being used by churchgoers in Scotland in the seventeenth century. A small pony and cart were used in connection with the chairmaking business, presumably to collect raw materials and to deliver the finished product. Peter and his elder sons would often take a consignment to the racecourses where they would sell a considerable number. The naming of the children did not follow the traditional Scottish pattern whereby the first sons were named after the grandfathers and the first girls after the grandmothers. Mary Jane may well have been named after one of her grandmothers but we do not know that. Frank appears to have been named from the Mamo family. Peter would have been named after his father. Richard West is the names given to one of Gessippa's half brothers. Andrew, Ernest and James William would only have a family connection if Peter McKie was born in Balmaclellan. Peter died in 1906. He had been admitted to the St George's Infirmary on 10th April that year but discharged himself on the 16th. He was readmitted on May 1st suffering from Pneumonia, from which he did not recover and died in the hospital on 6th May from the disease and cardiac failure. After he died, the chair making business was continued by some of the older boys for a few years, from various places after the family moved out of Pennington Street, including an old former pub in Cable Street. Still having several young children to support, Jessie McKie married again- to George Pokham, a seaman, whom she married in 1908 in St. John the Evangelist Church, Wapping. At this time the family were living in 8 Watt Street, Wapping. George Pokham died in about 1936 but I have been unable to trace the record of his death, nor where he was born. Mary Jane married Ernest Rudder in 1895 and had six children, two of whom died in early childhood. In 1911 the family migrated to Toronto, Canada. Peter McKie Born in Scotland. The civil registration of births deaths and marriages in Scotland did not commence until 1st January 1855, so prior to that one has to rely on the parish records. 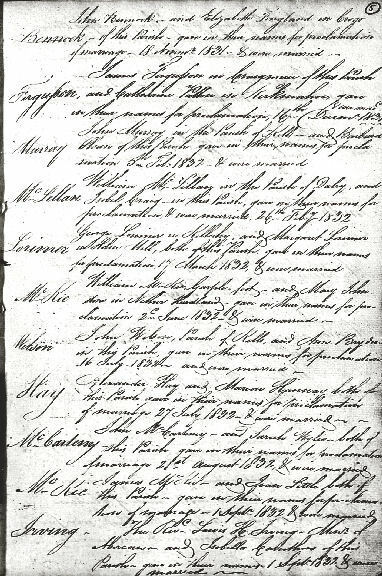 The preserved copies of the old Parish Records for Scotland, whilst extensive, are not complete, so failure to find a record there is not conclusive. According to the statements made to the various census enumerators, Peter McKie , my Grandfather, had been born some time between 1836 and 1853, and he enlisted in the army in Dumfries in 1871. It appears to me that it is reasonable to suppose that he was in fact the Peter McKie born in Balmaclellan in 1849, there being no other Peter McKie of an appropriate age showing in the available records, living in that area at the time. On 22nd April 1849 Peter McKie the son of James McKie was baptised in the church at Balmaclellan. The name of the mother is not shown. James McKie a labourer, who had been born in Minnigaff, Kirkcudbrightshire and the son of William McKie, married Jean Little on 1st September 1832 in Balmaclellan. They appear to have remained in the village and had seven children there. John , born 1833, Mary Jane , born 1837, baptised 6 September 1837, James , born 3 January 1840, George , born 20 March 1842 , Robert , born 13 May 1844 and baptised 16 Jul 1844, Andrew Murdock , born 1 January 1847, baptised 25 Apr 1847 and Peter , born 15 April 1849 . All the children with the exception of Mary were shown as being born in Balmaclellan- she was born in Minnigaff. Jean Little apparently died some time just after the taking of the Census as James married Amelia Hume in Balmaclellan on 18th November 1851. Amelia was a single woman living in the village at the time of the 1851 census. Jane , born 1852 , Henry , born 6th February 1853, Thomas Bell , born 7th August 1854 and baptised 8th Oct 1854, Helen , born 13th July 1856, Elizabeth Murray , born 2nd December 1858, William , born 25th February 1861, James , born 10th February 1864, Agnes , born 21st February 1867, and finally Jessie born 2nd June 1870. At the time of the 1861 census James and Amelia, still living in Balmaclellan, had Peter, Jane, Henry, Thomas, Helen, Elizabeth Murray and William living with them. So Peter was the only child of the first marriage still at home at that time. The 1871 census showed that by then, Peter, Jane, Henry, Thomas and Helen had also departed the family home. Previous censuses had only shown that the family lived in Balmaclellan Village, however the 1871 showed them as being at Rowantree Cottage. By the time of the 1881 census, James McKie is living alone in Rowantree Cottage. His wife Amelia had obviously left him as she was living in her home village of Springholm, Nr Urr, with her daughter Jessie and a 4 year old James McKie, described as her Grandson. Amelia's occupation at that time was shown as Grocer. The grandson was the son of the daughter Helen, who was then married to James McPhee, and the boy was later shown as having the surname McPhee. By 1891 the elder James is still living alone in Rowantree Cottage as a 82 year old Pauper. Amelia is still in Springholm, also alone and shown as a Outdoor Worker. James McKie died 12th March 1892 of Apoplexy at Auchroch Cottage Balmaclellan. Amelia died in Troqueer, Kirkcudbrightshire in 1908. 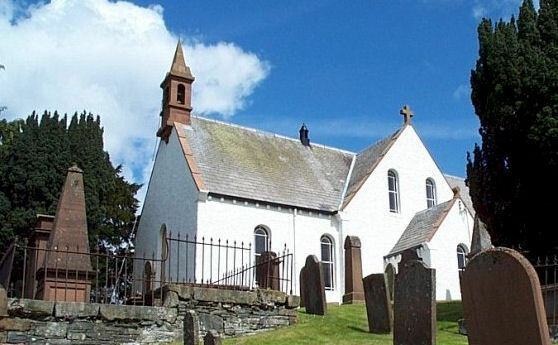 Of the fifteen children of James McKie we have only been able to establish the marriages of four of them..
Balmaclellan is one of four parishes in the northern district of the Stewartry of Kirkcudbright commonly known by the name Glenkens, and is now part of Dumfries and Galloway. There is no market town in the parish, so that the markets of Castle Douglas and Dumfries were those used by the local farmers and other inhabitants. Much of the farming land was pasture in those days and the Galloway cattle was the most often kept. The area is known as the Southern Uplands, neither Highlands nor Lowlands, and being on the border with England, there has always been migration both ways. There were also quite a few Irish born inhabitants in the area, some with variants of the name McKay or McKie. Just to confuse the family historian. Jessie McKie, our paternal grandmother was born in Malta in on 4th October 1862, less than three months after the death of her father. Her mother, Liberatta was therefor left a widow with a two year old daughter and her new baby. The family lived in Cospicua, or Bormla as it is known in Maltese ,close to Valetta, the capital of Malta, a town in its own right being one of the Three Cities (the others being Senglea and Vittoriosa), at the head of Dockyard Creek, just south of Valletta across Grand Harbour. The story of Malta goes back to prehistory and the island has some of the world's most ancient historical buildings that pre-date the pyramids of Egypt and most other historical sites in the Mediterranean. These indicate that its original people enjoyed an advanced civilization while the rest of the world was in intellectual darkness. As is well known, the Island of Malta is situated in the Mediterranean, and regarded for thousands of years as having a strategic position to empire building nations wishing to rule the sea and the surrounding countries . Malta which actually comprise a group of seven islands has therefor had foreign invasions from the time of the Phoenecians, over 2600 years ago. Since that time the island has been ruled by the Romans, Arabs, the Knights of Malta, France under Napoleon and finally Britain before becoming independent in 1964 and then a Republic in 1974. At the time of Gessipa's birth in 1862, the Naval Dockyard maintained by the British Navy adjacent to the town, provided the main employment in the area. There was also a substantial Military garrison in the town, which was to play a large part in the fortunes of the little family. Gessipas parents, Joseph Fidele Francis Salvatori Federico Publico Mamo and Liberata Marie Scerri (Xerri) were married on Sunday 11th July 1858 in the Parish Church of Cospicua, which sits on the side of a hill overlooking the Naval Dockyard. The surnames Mamo and Xerrie or Scerri are fairly common in Malta and appear in parishes all over the island . Joseph had been born in 1835 in Floriana and was the son of Ignatius Mamo and Rosa Saliba. Ignatius and Rosa had married in 1820 in the Church of St. Paul Shipwrecked in Valetta and had three children, including Joseph baptised there. 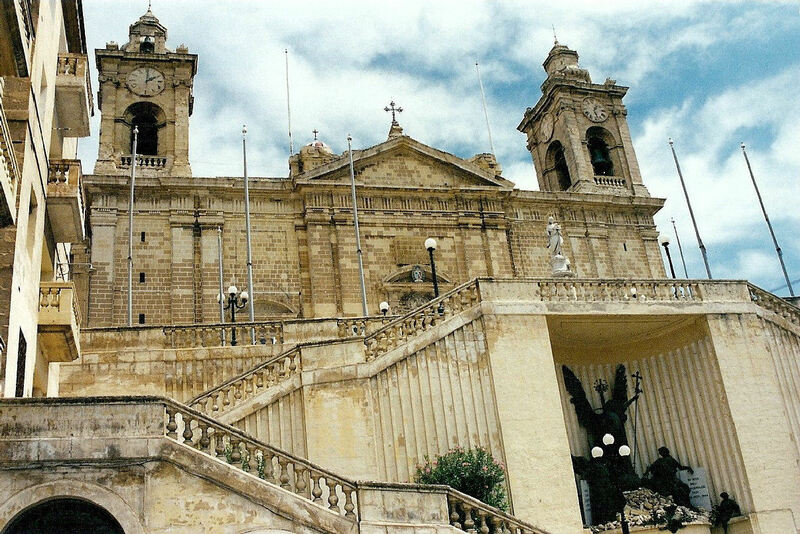 Ignatius' parents had come from Qormi and further back the family had lived in Zebbug. Liberatta Marie was born in about 1844 but we have not been able to identify the place in Malta, but presumably it was one of the Valetta parishes. Liberatta was the daughter of Salvatori Scerri and Angela Muscat who had been married in Cospicua in 1840. 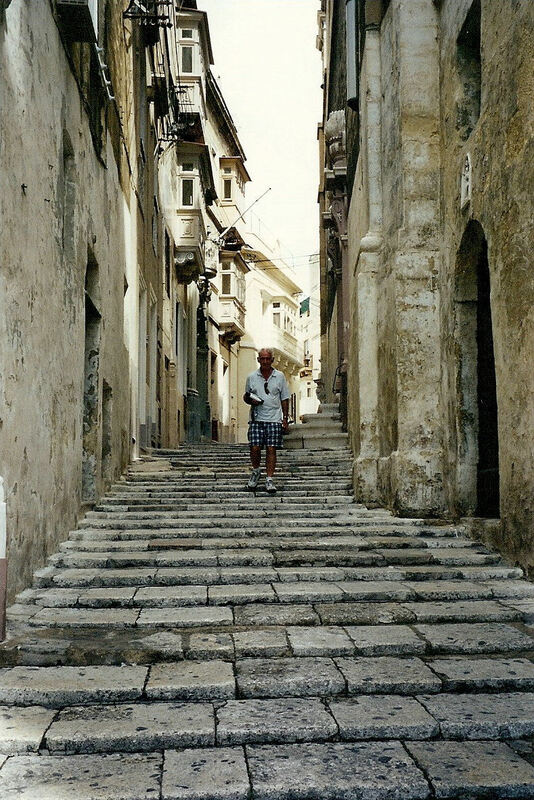 This Scerri family had originated in Gozo, but it appears that at least two generations had married in Cospicua. The first child of Joseph and Liberatta, Rosa Ignatia Josepha Marie was born on Friday 11th May 1860 and baptised the following day in the Parish Church. Liberatta fell pregnant again in 1862, however before the birth of the child Joseph died on 4th July 1862. As this event took place before civil registration began in Malta, we have no means of knowing the cause of his untimely death at the age of 27. His occupation was shown as a Constable so that one supposes that he was a member of the Maltese Police Force, but we have been unable to confirm that. Josepha Maria Rosaria Paula was born on Saturday 4th October 1862 and baptised the following day in the parish church in Cospicua. The name as mentioned is what appears on the Baptismal certificate that was supplied to us by the parish Priest. It is not clear if Josepha is an anglicisation of the name Giuseppe, which is a much more likely spelling of the name in Maltese. Also she was know as Jessie for most of her life. How Liberatta managed to support herself as a widow with two young children, we do not know. Her parents may well have still been alive and she had at least two siblings, Caterina and Francesca, so she would no doubt have had some family support there. It is unfortunate, from the point of view of the family historian, that the British control of the government of Malta did not extend to the taking of censuses, in the same way as those in Britain. In 1868 Liberatta met and married a British soldier Thomas Anson , who was serving in the 8th Regiment of Foot in Malta at the time. Their first child was born in the same year in Malta. About 1869, the 8th Regiment was posted from Malta to India, so Thomas and his family went together. At one time we assumed that Jessie also went with them because we were not aware of the existence of her sister, and we could not tie in how she had met her future husband. It now seems clear that the two Maltese daughters of Liberatta remained behind in Malta, presumably cared for by grandparents or other members of the family. Once again there is no means of knowing how the two sisters spent their childhood years. Certainly Jessie did not acquire a very good grasp of the English language and did not learn to read or write in English. The elder sibling, Rosa ,also married a British Soldier, William Chance. They were married on Tuesday 3rd September 1878 in the Archbishops Palace in Valetta and the Officiating Priest was Dr. Geoffrey Xerri, the Vicar General. We have no means of knowing if he was related to the sisters, or why the marriage did not take place in one of the parish churches. William Chance was serving in the British Army in 1871 in Aldershot and appeared on the same census returns as Peter McKie. William and Rosa had two children in Malta, and after their return to Britain between 1881 and 1883 they had a further seven children. Up until the 1901 census, the last record we have of them the family were living in Lambeth. Jessie, however had already left Malta, presumably in 1878, when her husband to be, Peter McKie, took his discharge from the army. She was then reunited with her mother and stepfather and their children.